I was raised in the South, but my folks were both raised in the North. I grew up in a house that was geographically in North Carolina but culinarily in Queens. This caused me more than a little stress growing up. Living right in the heart of the Queen City, I had no idea what grits were, or cornbread, and we never ate collards and black-eyed peas for New Year’s. Not until I was an adult did I discover the warm comfort that is a big old piece of Southern corn bread mashed up into a soupy plate of pinto beans. Southerners ate biscuits. We had rolls. Southerners ate cheese grits. Mom served cream of wheat. Southerners ate chicken and flat or “slick” dumplings. When we had dumplings, ours were big and puffy and sat atop a fricassee. Don’t get me wrong, friends. I love rolls, and I even like cream of wheat. In the great dumpling debate, I won’t throw a puffy one on the floor if it’s offered, but I do come down on the side of the slick dumpling. I had some catching up to do. Southern fried chicken. The glory that is whole hog barbecue. Nubby cubes of golden cornbread. Fluffy buttermilk biscuits and sausage gravy. Collard greens and field peas. Rich yet thrifty bread pudding. Crispy-tangy fried green tomatoes. Homemade pimento cheese sandwiches. If you aren’t sure what a progressive dinner is, it’s when different folks are responsible for different courses, and everyone goes from house to house enjoying a long, leisurely, peripatetic meal. So much fun! Barb from Creative Culinary thought it was high time the tradition was carried on in the virtual world, and Progressive Eats was born! We even have a hashtag, #ProgressiveEats. Look for it to follow all the posts the fourth Tuesday of every month. When I heard that the theme of the inaugural progressive dinner for Progressive Eats was Summer in the South, I believe I might have cut a small caper. I at least grinned fairly broadly. Because I am up to speed and ready. I still live in the south–going on fifty years now–and I’ve been practicing. I just went and looked at the final menu, and friends, you are in for a treat. What you will experience through all twelve courses is truly a Southern feast. From appetizers, to salads, a soup, main and bread to sides drinks and desserts, we have got you covered. I will share the menu at the end of this post so you can go and feast your eyes, bookmark and pin and make. We invite you to dine with all of us, around our virtual table, as we enjoy a feast inspired by Summer in the South. Rather than going with a dessert, I decided to update a traditional southern side dish. 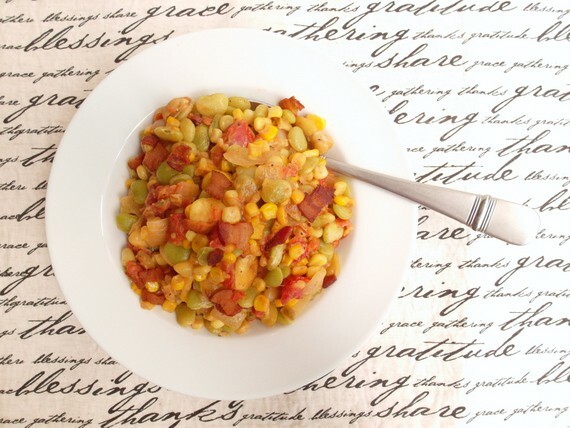 At its heart, succotash is a pretty simple mixture of corn and beans enriched with some cream. That’s great and all, but I do like to mix things up just a bit. 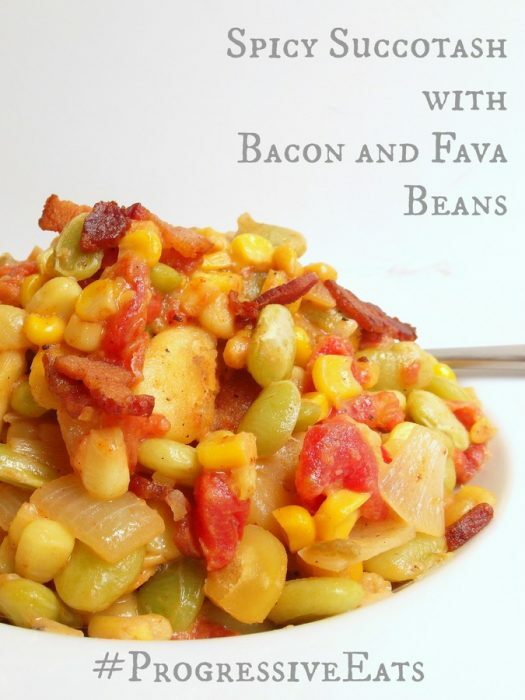 The succotash I’m bringing to our table today is a spicy one full of the expected corn and beans, in this case limas, but jazzed up with some bacon, fava beans, cayenne and one of my favorite southern shortcut ingredients, a can of Ro-Tel. The result is creamy and complex. You can easily make this vegetarian by leaving out the bacon and bacon fat or take it all the way to vegan by subbing in a vegan “butter” or some coconut oil. I think a sprinkling of Marly’s Bacon-Flavored Almond Slivers would be great in either a vegetarian or vegan version. 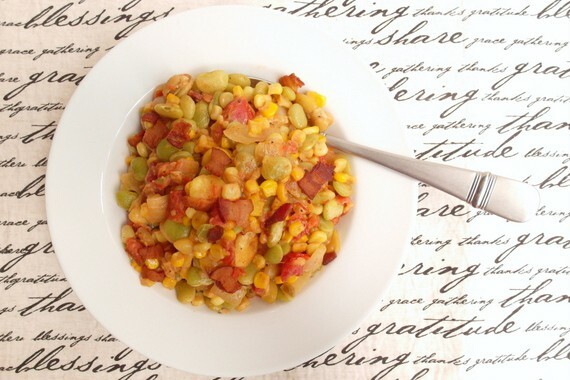 I hope you enjoy this spicy succotash as much as we do. Cook the bacon in a large, heavy-bottomed skillet until crisp. Crumble it and set aside. Pour off all the fat except about 1 Tablespoon. Add the butter to the pan and then cook the onion along with some salt and pepper until translucent, about 5 minutes. Add the corn kernels, lima beans, Ro-Tel and cayenne. Stir to combine and heat through. Taste and adjust the salt and pepper as necessary. Add the broth or water. Bring the mixture to a boil and then cover and reduce the heat to a simmer. Let the vegetables simmer about 5-6 minutes until the limas are approaching tender. Remove the lid, add the cream and turn the heat back up to reduce the broth/cream mixture to a thick sauce, about 5 minutes. Add the reserved fava beans during the last 3 minutes of cooking to heat through. Stir in about 2/3 of the crumbled bacon. Top each serving with additional crumbled bacon. Please go check out all the other courses. We’re starting with Lana from Never Enough Thyme who chose this month’s theme (yay, Lana) and then stopping by everyone else’s place to enjoy course after delicious course. Pastry Chef Online – Spicy Succotash–You’re already here! Interested in participating in Progressive Eats or just want to know more about it? 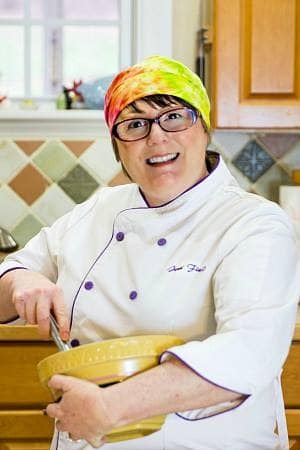 Find out what you need to know on Barb’s site here on her Progressive Eats Page. Thank you, Barb, for putting this fantastic group together! And thank you, dear readers, for stopping by and enjoying a virtual meal with all of us. We appreciate your company. I can just imagine your bewilderment living smack-dab in the middle of the South in a family with a Queens culinary background! Must have made for some amusing moments! 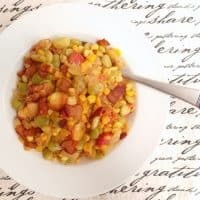 You certainly seem to have acclimated over the years because this succotash would be welcome on any southern sideboard. Bravo. Thanks, Lana! Fortunately for me, it has been a delicious process of playing catch-up! I too am a “naturalized” southerner — 20 years here now after growing up in California — and I’ve yet to meet a chicken-hugging dumpling, slick or fluffy, that I didn’t like. This dish sounds like 25% of heaven on a meat ‘n three plate. (Let my other three be fried chicken, smothered cabbage, and rice & gravy.) Right now I need to go look at that Macque Choux Soup. Yum. Jenni, I just saw on the Progressive Eats event plan that YOU are scheduled to host the Holiday Desserts fest in November. OMIGOD I can hardly wait to see what you come up with! Please, please give us a little preview here when you get your plan formulated! I’m looking forward to that progressive dinner too–it is going to be delicious! Not sure what I’m doing, and knowing myself, I probably won’t even figure it out until the week it’s due, but if I do plan ahead, I will share an instagram preview! That’s true Southern cooking then, Jenny! Making do with what you have, even if it’s just to see if you can. And it’s delicious–hope you love it!